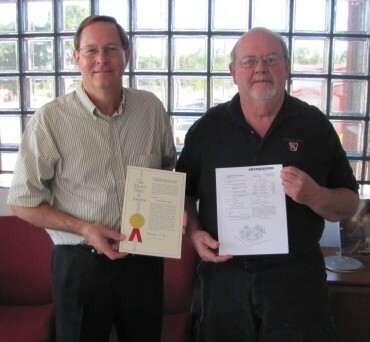 PATENT FOR 1891 UHMW-PE Dome | Clay & Bailey Manufacturing Co.
Brad Holmes, Clay & Bailey Sales Mgr. KANSAS CITY, Mo.—After a nearly three year vetting process, Clay & Bailey Manufacturing was awarded a U.S. Patent #9,334,108 for its 1891 Manway UHMW-PE dome. The dome is designed so that all surfaces are non-corrodible, thus extending its life cycle and value to the consumer. The 1891 is constructed of polymer resin, which is resistant to strong acid solutions and petroleum. Another unique feature is its embedded cover. This adds strength to the cover while minimizing the exposure of the plate to the harsh chemicals stored in the tank. The 1891 Manway UHMW-PE Dome was designed by Clay & Bailey staff: Donald David and Brad Holmes. Clay & Bailey Manufacturing produces tank accessories and corrosion control equipment for storage tanks used by the petroleum industry.